All good event planners will agree that when you are planning a large gala event or other such function, there really is no reason to leave anything to chance. After all, failing to plan is planning to fail, which is why it is important to ensure that you have taken every eventuality into account well ahead of the big day. Every event planner is different and will have their own individual way of organising the various elements of a function. One really great, extremely modern way in which you can help ensure that your function will go off without a hitch is by investing in a fully rendered 3D event plan. A 3D event plan offers you a glimpse into the future and a look at exactly what your function space will look like once all the relevant seating arrangements, audio visual equipment, and decorations have been put into place. From an initial 2D floor plan layout, a full graphical representation of your event space is brought to life before your very eyes through the latest in digital design technology. You can then zoom in and out via a video flyover for a closer look, or to get a full, big-picture representation of what your event layout will look like. The advantage of 3D event planning is that it offers peace of mind, an assurance there will be no unwanted surprises on the night, and that your event will fully represent your initial vision. Furthermore, you will be able to determine whether any guest will have an obstructed eye line or will be disadvantaged in any way – an important part of ensuring that everyone has an enjoyable night. For professional event planners, a 3D event plan is also a great way to impress clients, ensure that your pitch stands out from the crowd and increase your ROI. Step into the future and invest in a 3D event design when planning your next event, and discover the advantage that innovative technology can provide. At Pro Light & Sound, we always stay ahead of the technology game and are always on the lookout on how we can bring extra value to our clients. 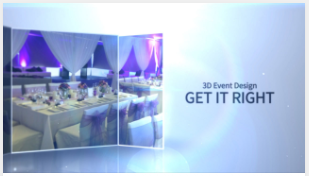 Talk to us about a 3D event plan and make sure your next event is plan perfect.